Our hearts go out to all of the people affected by Hurricane Harvey in the gulf coast states. The images that we are seeing in the media are dramatic and we can only imagine what the people are going through as their lives are endangered, and they see their homes and businesses damaged or destroyed. Right now efforts in the area are focused on safety and shelter. When the storm ends and the waters start to recede, businesses large and small will have to figure out how they will get back up and running. Do you know what you would do if this was you? What does it take for a business to survive a disaster? The first step in disaster recovery planning is to think about all the risks that might threaten life and livelihood. Here in Minnesota, we might not be threatened by hurricanes, but we have our own severe weather conditions that could threaten people and their businesses – tornadoes and high winds, heavy rain causing flooding, blizzards, and ice storms. As you make your list of threats you can also include power failures (which also are a common after effect from other disasters), hazardous material spills, acts of terrorism, cyberattacks and civil unrest. If in reading that list, you think – that’s not going to happen here, to us. Think again. It can and your ability to survive will depend on how you prepared to respond. According to the Federal Emergency Management Agency, about 40% of businesses will not survive a major disaster. The ones that do survive will have a plan and will use the plan to respond to the threat, and then to rebuild afterwards. Emergency Response – What employees do to stay safe and minimize damage to property. Communication Plan – How you will communicate with employees, customers, suppliers and people responding to the event. Include what to do if your corporate systems are down. Business Continuity – How you will maintain or restore your business activities. Physical Resources – depending on your business, you might need to identify another business that could continue production or provide space. Don’t forget to think about your supply chain. Human Resources – In addition to responding to the emergency if they are at work, consider how you might need to help people with physical needs and the emotion effects of disaster. Data Backup – How and where your business data is stored as well as its accuracy and the ability of your employees to use backups to get business processes going. This is just a partial list of sections that could be included in your plan. 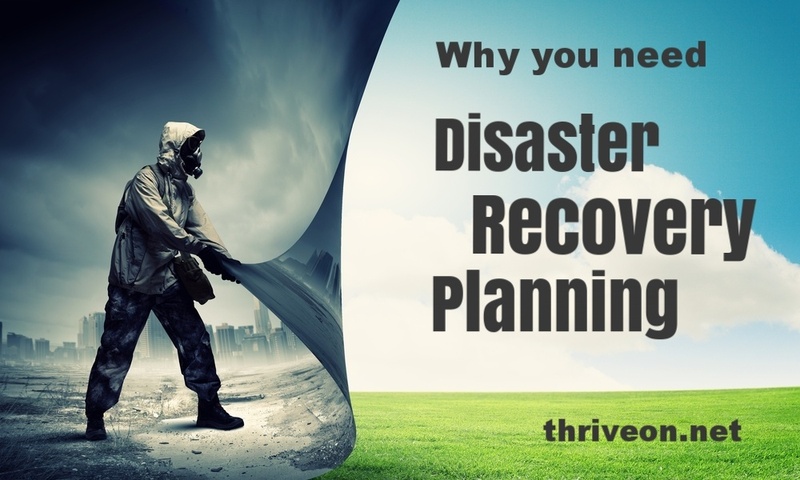 Your Disaster and Recovery Plan will be as unique as your business. Your ability to use it will depend on how you have trained employees to implement the plan. Here at Thriveon, we include Business Continuity as a critical part of the customized IT strategy we develop with our clients. This includes business processes as well as data backup. Your ability to safely store and retrieve your business data might not be the first thing you think of when disaster strikes. But when you are ready to get back to business, you can’t get going without it. Contact us to explore how IT services that combine strategy and management can help your business improve and grow. Call us at 855-767-2571 or give us your contact info and we’ll call you. To help businesses in the Hurricane Harvey Hit Zone, contacting the US Chamber of Commerce is a good first step.